Alexandria is the secure walled settlement of expensive homes that is encountered by Rick’s Group in Season 5 of The Walking Dead. During Season 6, we see how the attacks on the community require the extension of a cemetery by the walls. But the community does not bury killers within the walls: only those that in life, played by the ‘rules’. The cemetery is already extant when Rick’s group get there. It is located in a secure space surrounded by trees against the side of a building. The cemetery is thus screened by vegetation, a building and walls. It is private and secure, intramural yet liminal. See my discussion of it here where I contrast it with Rick’s decision to dispose of ‘killers’ in the woods. 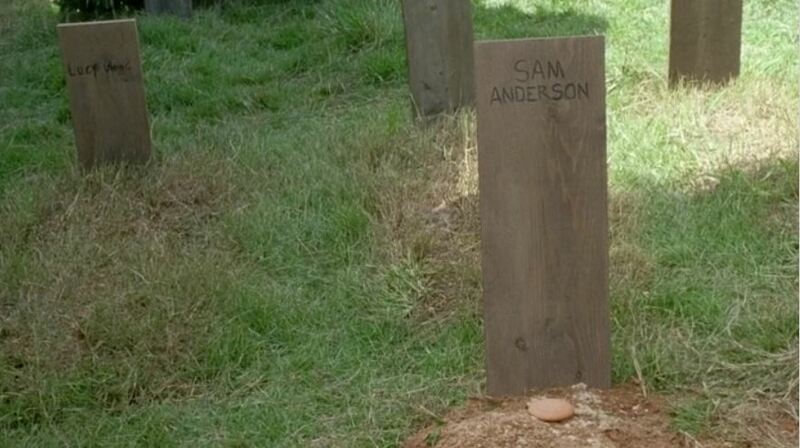 The wooden planks utilised as grave-markers are neat and machine-cut, unlike the crude crosses and markers of Eastman’s cemetery and the cemetery created at the Correctional Facility in Season 4. Yet like the latter, they represent an attempt at post-acopalytic cemetery culture. The trimmed grass and the neat arrangement also define the ‘civilized’ nature of the burial ground. It’s secular nature is also clear: there are no religious markers, no expressions of faith at all. Stark, simple, wooden with names along carved on them: without dates, without age and thus without time. Everything speaks of a new community of the dead, created with equality and stark austerity. There is not flambouyance and emotive materiality. Later in Season 6, we see more of the cemetery once the invasion of ‘walkers’ has been defeated. We are shown grave-digging in the cemetery with a pile of corpses. Notably, we see a single female grave-digger, a situation in stark contrast to other grave-diggers in earlier series of TWD. We last see the cemetery with Denise’s body being interred, with back-filling of the grave taking place by Carol and Daryl. Previous Previous post: Digging into the Dark Ages – Logo Launch!